Anyone who likes luxury at a campsite has more choice nowadays. Comfortable and attractive accommodation can be found at the loveliest spots on the campsite. A four-poster bed, rain shower, jacuzzi, lounge sofa, airconditioning; nothing is too much. Sometimes glamping is even more luxurious than you are used to at home … I would like to present three campsites in this blog which offer a wide range of glamping options in the top holiday destination of 2019: Slovenia! Perfect for families with children. In addition to the spacious main accommodation (which sleeps six) you also have use of the Kambi, a comfortable little tent with two real beds. Sleeping under canvas gives your holiday an adventurous touch, while of course inside you can enjoy every luxury. A holiday home to dream of. With more than fifty square metres you will have plenty of freedom. Three bedrooms, two bathrooms, a spacious kitchen, dining table, lounge sofa … But things are just as good out on the patio. You can laze around on the DuoLounger or SunLounger. Rub in your sun cream, get yourself a drink and start enjoying it! An island kitchen in your mobile home? Yes, really, when you take your holiday in the Catalpa you can all sit around the island kitchen. Drinks and snacks on the bar and help yourself. And a welcome thought: after an evening of enjoyment to can crawl into a bed with extra deep mattresses and cotton sheets. The best of both worlds: that’s glamping. And that goes for the Taiga. Experience the casual camping ambience, the grass under your feet and the sun in your face. But at the same time you want comfort and quality, and that’s also possible! With a four-poster bed, rain shower, large dining table and covered patio, you’ll not be short of anything. Can camping get even more romantic? Your own jacuzzi. That’s what you get if you choose a Glamping Hut. These cosy wooden cabins are perfect for couples. The wood is untreated and that gives the accommodation a natural appearance. The cabin itself has a comfortable double bed, the rest of the interior is basic but well maintained. There is a luxurious toilet block close to the cabin with showers and toilets. You can admire the trees around you from the loungers in front of your cabin. Small sails ensure you get some shade when the sun is trying its hardest! The cabins are beautifully lit in the evening. If it’s romance you’re looking for, you’ll find it at Bled Campsite! 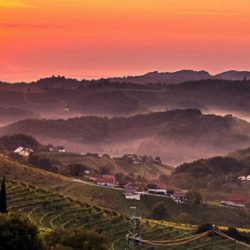 You’ll find Bela krajina in the south east of Slovenia. This four star campsite takes its name from the region in which you will be camping. There are various types of mobile homes at Bela Krajina in an unusually attractive location right by the River Kolpa. This marks the border with Croatia. The river is very shallow in some places, so you can wade from the campsite into another country! Waking up with this view will bring a smile to your face. If you have had some great glamping experiences in Slovenia, share them with us and with other campers. If you are interested in other blogs about Slovenia, you can read them here! 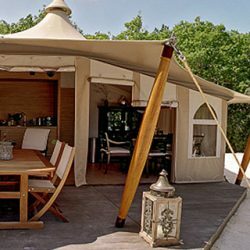 And if you prefer to you glamping in other countries, then I can recommend discovering all our blog posts about glamping. 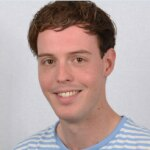 From Calais to Cannes, and from Nantes to Nancy: Jeroen has definitely done his fair share of exploring in France. With his parents and his brother, he spent weeks at the most beautiful campsites in a trailer tent. Then, the family travelled around the rest of Europe in a motorhome. Now he loves his cultural city breaks. He particularly loves funiculars and cable cars.